I must admit, we are always struck by how Humminbird consistently improves on its line of Fishfinders. This time around, it’s featuring the Helix 5 CHIRP G2 fish finder, which is one of the most powerful fishfinders we have ever used. With the powerful combination of switch fire, down imaging and side imaging Sonar, the Helix 5 has been able to stay ahead of the curve and garner a lot of positive reviews. For anglers who are looking for a Fishfinder that has all the sonar technology, this particular model is the best choice for you. Is Helix 5 a Value for Money fish finder? Unlike previous generations, the Gen 2 fishfinder stood out by featuring a CHIRP sonar technology that can scan water depth up to 1000 feet, using either the small, medium or high-frequency modes. 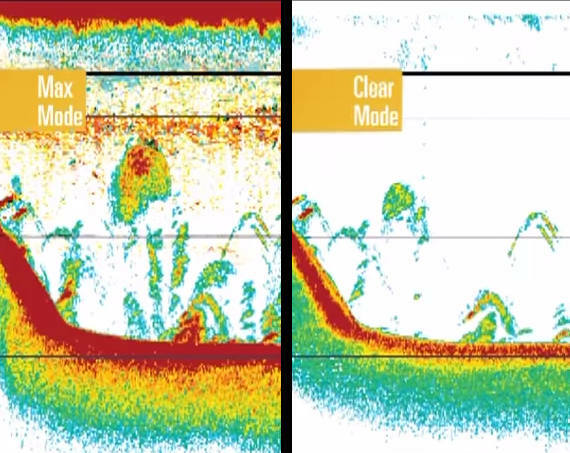 Not only does the G2 CHIRP sonar technology scan deep waters, but the unit also provides you with a high-resolution display, greater target separation, and highly reduced image noise. Just like its competitor (Garmin Striker 4), the Humminbird 410210-1 also comes with a waterproof rating of IPX7, which means it can withstand water exposure as well as resist full immersion. Unlike the Garmin Striker 4 that retails at around hundred-dollar price range, the Humminbird Helix 5 comes at a top dollar price of a three-hundred-dollar price range. But with the inclusion of impressive features like the side/down imaging, and fluid performance of the imaging sonar, the Helix 5 seems to beat the competition. Hence, it’s also included in the best fishfinders list. The design of this fishfinder is robust, magnificent and screams high quality at every corner. A Micro SD Card slot is tucked behind the waterproofed and removable cover to store marked locations. On the back of the device, you will find 3 Familiar Fiction fit connection port. The first port is the power port connected to a 12-volt battery source. The other port connects to your interface cable for connecting the GPS output to optional accessories. The last port connects to your dual frequency, down imaging, or sight imaging transducer. The G2 fish finder rocked our fishing performance tests. We were able to clearly see underwater structures and intertwined tree branches, using the Side imaging display. Switching to down imaging, gave us a vivid view of the depth of each underwater structure and contours. With this information at our fingertips, we were able to figure out the right spot to track and find fish. The next step was to turn on the switch fire sonar, which gave us the option to use either Clear Mode or Max Mode. Using the Clear Mode, gave us the strongest target, even to the bottom of the sea. After dissipating all forms of clutter, using the same Clear Mode, we got a clear focus on bigger fish. Apart from the fantastic performance of the Clear Mode, the Max Mode did a good job by offering us excellent views with all the sonar information we needed. With the Max Mode, we saw more fish compared to the Clear Mode, which could only detect big targets (fish). So, it strictly depends on which mode you want to choose. If you are out for a bigger fish, then you may want to use the Clear mode. But if you are the type of guy that wants a school of fish, then you may want to stick with the Max Mode. One little gripe with this device is that it doesn’t offer a Standby Mode like other devices, which is quite disappointing. That means if the power of the unit is about to go down, you can’t put it in Save Mode or Screen Saver Mode. Moreover, the Humminbird G2 also features some trusted and dedicated buttons that allow you to save your waypoints as well as a “go to” button to bring up saved waypoints. Interestingly, the G2 also allows you to take snapshots of your imaging when you long-hold the mark button. You can also zoom your pictures by pressing the zoom buttons. The out-of-the-box color accuracy of the display screen is impressive. The clarity of the screen is incredible, making the side imaging incredibly easy to use. The unit offers a 5-inch Ultra HD widescreen LED-backlit display with 800 horizontal pixels by 480 vertical pixels. The significant advantage of the display is that when you’re using the side imaging screen, you can spread your pictures across a wider area. If you decide to split your images into two halves, you will still get a nice size imaging for chart plotters. The chart plotter runs on Navionics Gold cartography. You can also create your own custom contour using the Auto Chart software. 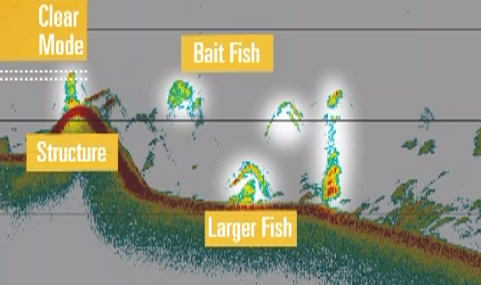 Humminbird Helix 5 already exceeded our expectations when it comes to the CHIRP Sonar and Transducer technology. Unlike other units that cover a single frequency, the Helix 5 moved a step up by offering a 2D sonar and CHIRP imaging that can not only cover a range of frequencies but also provide you with better clarity and excellent separation between the fish and water structures. The unit comes with a relatively large transducer, but the 15-millimeter magnetic transducer mount easily handles it and put the large transducer in place. The good thing about the transducer is that it also allows you to know the temperature of the water, and has the ability to go down to 1,500 ft. of water depth. Just like other high-end Fishfinders like the Gamin Striker 4, the Humminbird G2 device also features a built-in GPS technology that helps you to navigate your way around the lake. With this function, you’ll be able to keep track of our favorite fishing spot. The G2 Fishfinder also did a great job of featuring UniMap charts that show you different coastlines, inlands, streams with boundaries, rivers, and lakes. 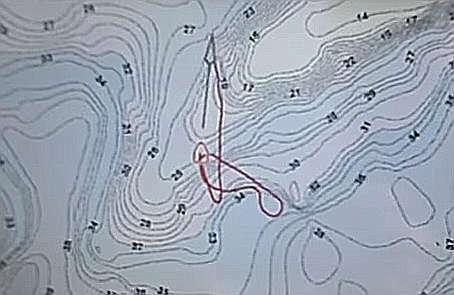 Although the charts aren’t detailed enough to give you all the needed information, they still come in handy, especially when you don’t have any advanced navigation tool. But if you decide to equip the device with Navionics Chart chip or a LakeMaster, then you can use the Auto-Chart Live. The Auto-Chart Live uses both the 2D sonar and GPS info to map and reveal the depth contour of the river. With the Navionics chip, you can also record up to 7 hours of mapping data at a go. Not to forget also that this particular unit comes with a fish alarm. In the Fish ID+ mode, you will get to see three alarm settings. Enabling the alarm will let you know if the Fishfinder detects a large, medium or a small fish. Did I forget to tell you that this amazing Fishfinder also features a sonar recording? This feature saves you the hassle of coming back to scan a particular spot. With the help of a memory card, the Sonar recording feed allows you to rewind or get a second look at a particular saved spot. The battery life of this Fishfinder is impressive. Our test shows that the G2 can last you for more than 7 hours of a fishing expedition. There’s no doubt about it: the Humminbird Helix 5 Fishfinder is a fantastic product with fluid performance and generous features. 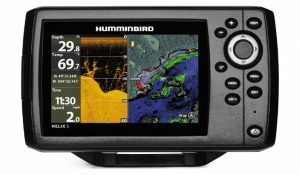 The additions of premium features such as the CHIRP Sonar technology, Unimap charts, GPS, and transducer, make the Humminbird 410210-1 HELIX 5 CHIRP GPS G2 Fishfinder one of the top and best choices for anglers. The unit can be used for both small and big size boats as well as fresh and saltwater. So, if you are looking for a Fishfinder that has all the excellent GPS and charting capabilities at a decent price point, then I strongly recommend this particular Fishfinder for you. I know nothing about fish finders. We have a 14 ft aluminum boat with a 9.9 hp motor. We only use it for trolling. We also like to ice fish. I’m looking at the Helix 5 and the Garmin Striker 4 to compare. The Striker 4 bundle is much more in my price range but I wonder if the suction mount would work on our boat. Also the down and side imaging on the Helix sounds really helpful, however I don’t think we need all the fancy mapping features. Most lakes in my state aren’t already mapped. Would the Striker 4 make a good Christmas present? Yes, it surely will make a good Christmas present. It’s one of the best entry level fish finders out there. I have this G2 Chirp and can’t seem to get to Down or Side Imaging screens. Any help will be appreciated.